and Out punches and other advanced time and attendance information. placing their finger on the reader. reviewing worked hours and even entering tip information. The IDpunch 7 is an Internet-compatible device that is easy to install. Plug into a power outlet and Ethernet port. 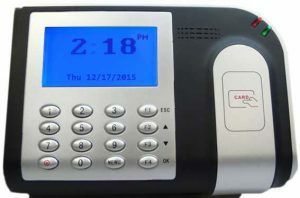 With minimal configuration, the IDpunch 7 communicates immediately with the time and attendance software. Industry-leading “HTTP Push” technology sends transactions to the time and attendance system. There is no need to poll the time clock. The IDpunch 7 continues to collect employee transactions even when the network is down, automatically forwarding transactions to the time and attendance system when the connection is re-established.